Jackson Ward is one of Richmond’s most historic neighborhoods that has experienced an economic renaissance in its downtown corridor over the past decade. With the promise of major future developments to come, Jackson Ward has thrived with new restaurant, retail, and living spaces. Jackson Ward’s revitalization was at the heart of a new VCC loan to help a local real estate investor purchase a 15-unit apartment building, called Bliley’s Garage. The property, once a service garage for a funeral home, was renovated in 2011 by David Gammino into 15 luxury apartments using historic tax credits. Located on one of downtown’s main thoroughfares, the multi-family units are within walking distance to the Central Business District, hot local restaurants, the thriving arts and cultural scene, and across the street from the convention center and Richmond Coliseum (a neighborhood also slated for possible redevelopment in the near future). Our involvement with Bliley’s Garage is largely a traditional commercial real estate financing and the borrower had to meet our debt and credit requirements. 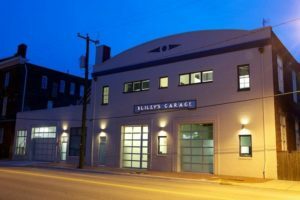 This project also had an aspect of a mission-focused financing, too: Bliley’s Garage boasts a 24 -kilowatt solar system on the rooftop and was built with high-efficiency HVAC units. The integrity of its design and construction led Bliley’s Garage to win the Better Housing Coalition’s Golden Hammer and Green Hammer awards, which recognize the region’s best and most environmentally friendly projects, respectively. The project also won the 2011 Greater Richmond Association of Commercial Real Estate’s award for best multi-family project. The key to vibrant communities starts with real estate developments to spur growth, job creation, and an improved quality of life. VCC offers a variety of financing options for real estate developers and investors: acquisition/refinance/rehab loans, construction loans, mini-perm loans, and low-income housing and historic tax credit financing. We provide financing to commercial, residential, and mission-based real estate projects, including multi-family developments, affordable housing, commercial properties, medical centers, healthy food grocers and more. As a mission-based lender, part of our focus at VCC Bank is not only on the financial return, but a nod to the future knowing we must invest in clean, renewable methods of power generation to reduce water and air pollution. If you are a small business looking to integrate solar technologies, our solar-lending experts can also offer third-party guidance to buyers to ensure you’re getting exactly what you’re paying for. Learn more about some of the considerations to make as you look into solar power for commercial use in a recent LinkedIn article by Bill Greenleaf, VCC Bank’s Solar Energy & Commercial Real Estate Loan Officer.